“Every bella deserves a beautiful prom,” is the mantra of The Bella Project. Sometimes it is financially hard for families to buy a dress when they are trying to just put food on the table. Enter fairy godmothers! 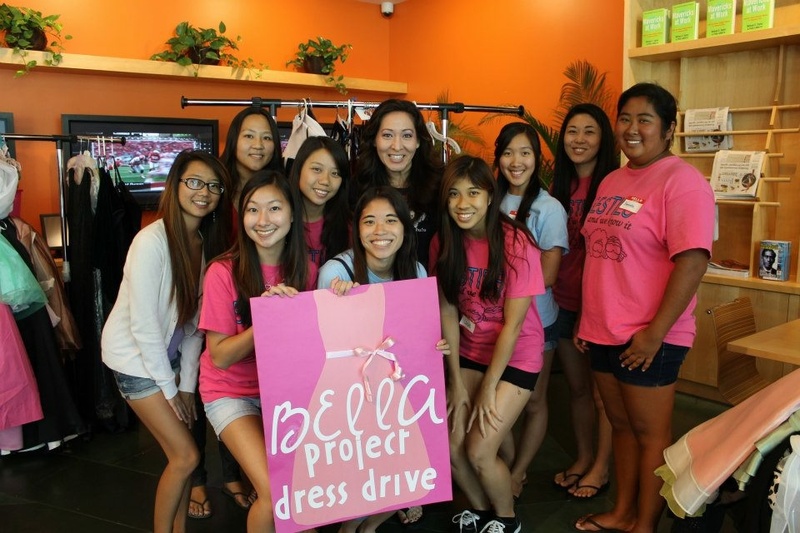 On Saturday, March 1, 2014 The Bella Project will be holding their annual Bella Boutique at the Central Union Church, Parish Hall from 10 a.m. to 2 p.m. As a non-profit organization, The Bella Project provides new and virtually new dresses and accessories to high school women free of charge. Dresses donated by the local community, boutiques, pageant queens like 2013 Mrs. USA Universal Amanda Brad and The Bella Project’s own President Valerie Schmidt Mrs. Ultimate Elite 2014 are beautiful, stylish and in excellent condition. The Bella Project was founded by Amanda Ross in 2009. In 2011, she moved away from Hawaii and turned it over to The Junior Leaugue of Honolulu. Three members from The Junior League, Valerie Schmidt, Tracie Young, and Charise Shigeta operated it and converted it into a 501(c)3 again independent from The Junior League. These ladies are currently the board members who are the leadership of The Bella Project. From a daughter: My mom was diagnosed with cancer, all of our money is going to her treatment. I am hoping that you will allow me to get a dress so my mom doesn’t have to worry about one more thing. From a mom: My husband has been laid off since last year, now my daughter can get something nice from you. From a mom: We live paycheck to paycheck. You have so many dresses for my daughter to choose from. “You’re turning Korean,” says my husband pointing out that I watch Korean shows, eat Korean food and use Korean beauty products. Kim chee, Lee Min Ho, soju, and snail beauty creams. These are a few of my favorite Korean imports. Add the latest best seller at Nature Republic to that list – the Peeling Foot Mask. I purchased my foot mask at Nature Republic for about $6. Like most Asian facial masks, it comes it a foil pouch. Inside the foil pouch are two clear plastic sock shaped bags with the liquid treatment inside. I cut the plastic bags where indicated and slipped them on my feet. I put a towel under my feet and relaxed with a good book for 90 minutes (the instructions say to leave it on for 60-90 minutes). Finally, I took the bags off and them, dried my feet on the towel and rinsed with warm water. You won’t see any difference for a few days. Day 1 thru Day 3 there was no change. Day 4 was when the peeling really began. The peeling continued for about another three days. After all that peeling, I followed up with a moisture foot mask which I also purchased at Nature Republic for about $5. There were still a couple of stubborn areas but they were much less calloused than before and I am happy with the overall result.